Located in Portland, Oregon, Doe is a women owned small business specializing in artisanal vegan donuts made from scratch with local, fresh and sometimes usual ingredients. Quality always takes precedence over quantity. We love to sell out and we don’t love day old donuts, which is why you will never see us selling them. Doe is dedicated to satisfying every human without hurting any animal in the process. Doe Donuts are heartfelt and refreshing flavor combinations made in a dedicated vegan kitchen, free of all animal products. At Doe, we leave cruelty and cholesterol at the door and open up your taste buds to a world where compassion and flavor meet to form the world's most perfect donut. Can't come in? We deliver with Postmates and Doordash! * Baker's choice means we choose for you! If you would like to choose yourself, they are simply individually priced! Cold Brews, Nitro, Kombucha, Juice and more! Crystal and Carly started working together in a popular natural grocery chain. Looking to boost sales and set the store apart from its regional competition, Carly started making fresh, vegan donuts every Sunday. Only offering 2 flavors a week, they quickly became a hit spread by word of mouth. Crystal soon joined in and they set out to hone in on their recipe until it was perfect. Two years later, Doe became an idea that slowly snowballed into a reality. Carly Sitner, Co-Owner and Chef of Doe Donuts has over 16 years of professional baking under her belt, working in restaurants, hotels, cafes, large scale production and the natural foods grocery industry across the US from NYC to Portland, Oregon. As a vegan for over 20 years, she has strived to create desserts that will accommodate her ethics and her taste buds. Carly has worked as a recipe developer for several bakeries and restaurants, adding vegan desserts to conventional menus to satisfy the needs and demands of every customer. A graduate of NYC based culinary school, The Natural Gourmet Institute, Carly is well versed in alternative baking and nutrition and has used her skills to create a product that is loved by all. Living and working in the industry in Portland, Oregon for the last 10 years, Carly’s products are on-trend with what locals and tourists desire. Crystal Wegener, Co-Owner and Chef of Doe Donuts is an Oregon native and a graduate of the Oregon Culinary Institute with a degree in baking and pastry management. She has developed her skills further both in private clubs and in the grocery industry. Both opportunities have allowed her to improve upon her knowledge and become meticulous in regards to developing and producing optimal products. Working with her hands to create doughs and pastries is what she loves best. Where we source our ingredients is important to us. We choose Local, Organic, Fair Trade and Non GMO when possible. We support local farmers and buy our produce fresh. All of our chocolate is certified fair-trade from the Food Empowerment Project. We believe that quality trumps quantity. Everything at Doe is made from scratch, using real, pure ingredients. Unlike other donut shops, we do not use a pre-made, factory produced mix. We do not use fillings that come in tubs or glazes that come in buckets. We do not use artificial flavorings. Cheap donuts are made from cheap ingredients and we want you to walk away knowing that your hard earned money was spent wisely. Supporting a small business, supporting employees who are paid a living wage, supporting families, supporting fair wages overseas, supporting non profits, supporting the environment and most importantly, supporting a plant based lifestyle. We are not a gluten or nut free facility. At this time we are not offering gluten free options. We do have many soy and nut free options. Please call, email or ask in person if you have any ingredient questions! Our flavors change every two months so the answer to your ingredient question might change constantly. For your birthday, brunch, wedding, baby shower or going away party, we do it all. Our donuts come in traditional or mini sized and can be custom flavored or you choose from our current selection of seasonal flavors. When ordering minis, suggest three per person. We require full payments of custom flavor orders no later than 72 hours before your event pick up time. Sorry we do not deliver! Due to a high request for special orders, getting your order in as soon as possible is recommended. We can not guarantee your order will be accepted so please do not wait until the last minute. Unfortunately we have had to turn away orders in the past due to filling up. We are more than happy to take special orders many months in advance. A minimum order of 12 large currently presented flavors are required. Feel free to mix and match flavors! Custom flavors currently not on our menu require 24 minimum per flavor. Custom flavors require a one week notice. Donuts are individually priced and range between $2.75-$4. Discounts on bulk orders start at 8 dozen. Mini donuts are the cutest! They are always a hit at any event or brunch. Order several flavors so your guests can try one of everything! We recommend ordering three per guest. A minimum order of 12 minis are required per flavor. Custom flavors require a one week notice and are a minimum of 24 per flavor. Minis are individually priced and range between $1.5-$2. Discounts on bulk orders start at 10 dozen. Letters are such a fun way to tell someone how you REALLY feel! Donut letters can be mismatched flavors and are $3 a letter. Six letter minimum required per order. 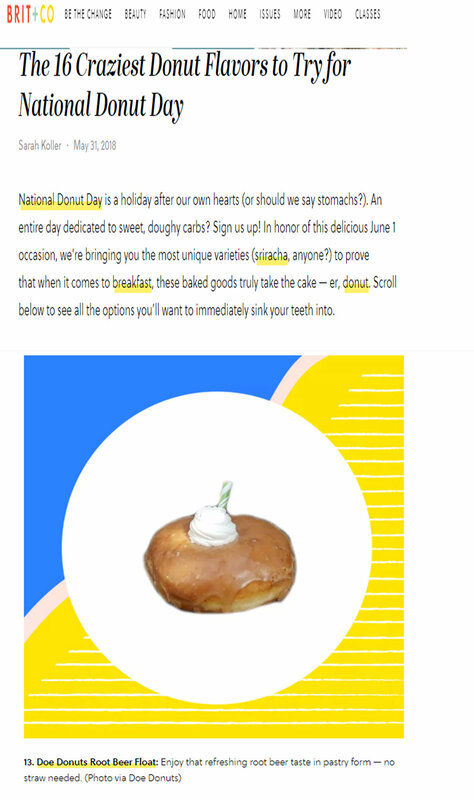 Letter donuts can not be made with flavors that have a filling or in savory. PLEASE NOTE: We do not sell/donate or encourage our customers to eat our donuts as day olds. For this reason, any orders not picked up the day they have been assigned, will be held until the end of the business day and then composted. As per our policy, we are not responsible for calling customers to remind them of their orders and we will not hold onto donuts for the next day. Customers will not receive a refund or replacement if they come in to pick them up any days after their scheduled day. We want you to have the freshest donuts possible, so please pick them up on the day you ordered them for! 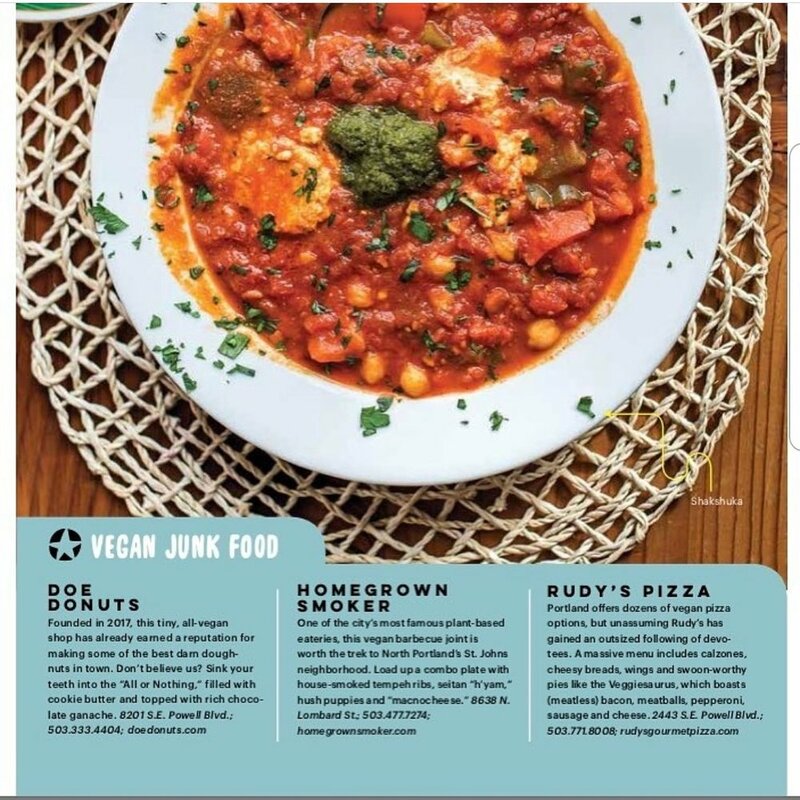 We don’t like empty bellies and we don’t like food waste! We love you and we appreciate your business! ARE ALL YOUR DONUTS VEGAN? Heck yes! We are a 100% vegan kitchen. Anything you get here will always be vegan. DO YOU HAVE GLUTEN FREE DONUTS? At this time we are not offering gluten free options. ARE YOU A NUT FREE FACILITY? DO YOU HAVE NUT FREE OPTIONS? No, we are not a nut free facility. Yes, there are usually 3 flavors of donuts (out of 15) that have nuts, the rest are nut free. Please keep in mind, cross contamination is possible. DO YOU SHIP YOUR DONUTS? We want our donuts to be enjoyed immediately or as close to being fried as possible and therefore will not be offering shipping. You'll have to come visit the great state of Oregon for some Doe! We do ship our shirts though! Due to distribution issues with plant based milks in our area, we currently do not have soy free options. We hope this will change sooner than later! WHAT'S THE BEST WAY TO STORE YOUR DONUTS? Don't! Eat them right now! Anything that has been fried is meant to be eaten right away. We do not suggest waiting until the next day or shipping them yourselves to others. We love the dedication and appreciate our out-of-state followers, but no body wants a hard donut! Every month Doe picks two organizations to donate to. Sometimes it's cash donations, sometimes it's loads of donuts, sometimes it's a percentage of sales! To request a donation, please email doedonuts@gmail.com. Please be advised that we receive upwards of 50 donation requests a month and non-profits almost always take priority. We do not take requests farther than 3 months out. We do not sell or donate day old donuts. We will always get back to you regardless! Thank you for everything you do!